Always celebrate the life of your passed loved one with our beautifully engraved, Memorial Ornament Keepsake. Whether you choose to display it as an honorable keepsake during Christmas or display it as a sparkling sun-catcher to celebrate their lives. 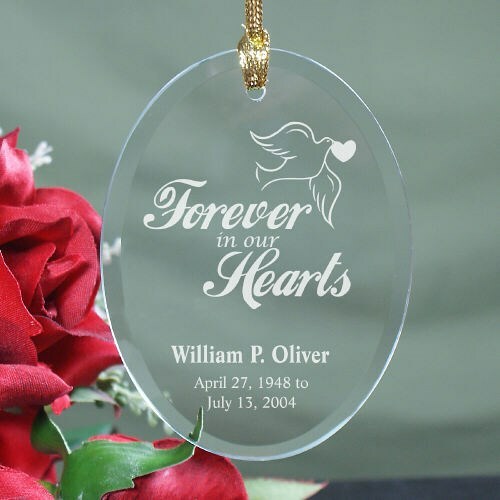 This Engraved Glass Sympathy Ornament measures 3.75” x 2.75” and includes a golden ribbon loop to gracefully hang anywhere you choose. A free Gift Pouch is included to create a wonderful presentation and safekeeping. Free personalization of any name and dates are included. Please enter the name and dates exactly how you wish them to appear on the ornament. Additional Info A Custom Printed Memorial Keepsake from MyWalkGear.com, is a wonderful way to honor their lives and treasure the memories you have. Browse through our entire collection of Memorial and Sympathy Gifts to also find our beautifully Engraved In Loving Memory Ornament & our Personalized Memorial Heart Ornament as well.